Seeing ants swarming just sometimes have to make our move away, what if the insect world to see? Researchers recently found an insect in the world, including Dobsonfly class. When the animal wings outstretched, reaching 21 cm in size and capable of closing the human face. The biggest insect found to have a creepy claws. These insects are found in Sichuan Province, China. 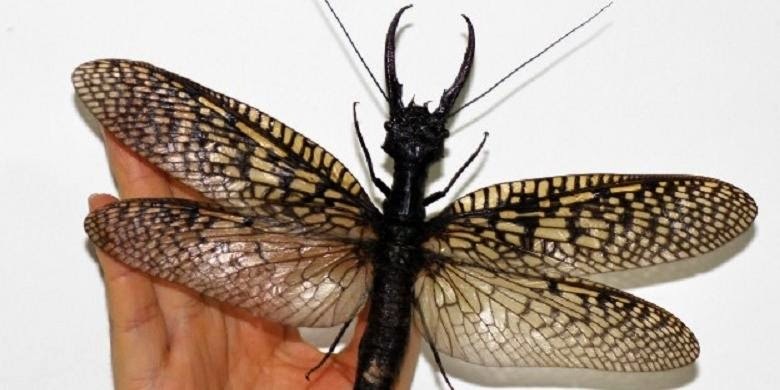 With its size, the China's Dobsonfly is beating the largest insect ever, Damselfly, which comes from South America, which has a size of 19.1 cm. This giant aquatic insects have important functions in aquatic environments. Its presence is an indicator of water quality. As reported by Nature World News, on Tuesday, 22Juli 2014, giant Dobsonfly sensitive to pollutants, temperature, and acidity. When the water is polluted, these insects will move elsewhere. So far, not a lot of information about the Megaloptera class insects. However, scientists also know that similar insects living in Assam, India, and northern Vietnam. These animals are not the only giant insect. There is a giant moth wings reach a human foot. There is the giant-version of the bug species weta - similar to a cricket - can easily consume a carrot.